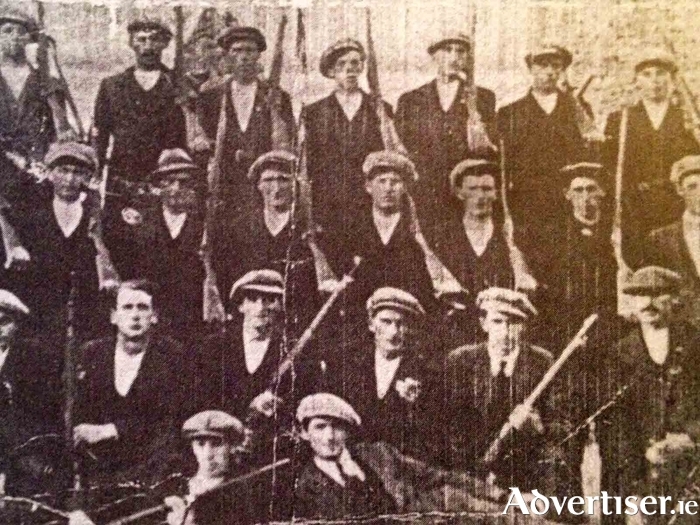 Claregalway volunteers from the 1916 - 21 period. Galway was, along with Tyrone, Louth, and Wexford, one of the few counties to actually take part in the 1916 Rising, and outside of Dublin, County Galway saw the most significant level of activity. While the city remained quiet, and firmly in British hands, and indeed displayed a fair level of antipathy towards the Rising, county areas were much more pro-Rising and Irish Volunteer (the fore-runner of the IRA ) companies from Oranmore, Maree, Athenry, Clarinbridge, Craughwell, Castlegar, Claregalway, Cregmore, Peterswell, and Derrydonnell, more than 300 men, led by Manchester born Liam Mellows, took part in activities, including battles with the RIC and exchanges with the British army. However Galway city did provide a significant figure in the 1916 Rising in Eamonn Ceannt, a signatory to the 1916 Proclamation. To commemorate the centenary of the 1916 Rising, which set in train a series of events that would culminate in Irish independence in 1921, the Galway City Council has launched and extensive programme, focussing on Galway, which is part of the Ireland 2016 Centenary Programme. Among the events planned for neat year is Remembering Éamonn Ceannt, a week-long celebration of the life and work of the 1916 Proclamation signatory, who was also a prominent musician; Revolution in Galway 1913 -1923, a new dedicated gallery at Galway City Museum; Seacht mBua an Éirí Amach, the first compete translation and publication in English of Pádraic Ó Conaire’s short stories inspired by the Rising; and a series of community and local library based lectures and events across the city proposed and run by community organisations. The programme was launched recently in City Hall. Speaking at the launch, city council chief executive Brendan McGrath, said: “The story and events of 1916 belongs to all of us regardless of political or family background, or personal interpretation of our modern history. I am delighted so many people, and especially our children and young people, are taking part in such a diverse range of events across our county next year. The full programme of events is at www.galwaycity.ie The programme is the outcome of consultations with interested local groups, organisations, and individuals, who were invited to participate in the planning and implementation of the local programme. Page generated in 0.2140 seconds.